A 3D racing game that was released for several platforms by MicroStyle and The Creative Assembly. The aim of the game is to race insane 3D tracks and don’t fall off the track. This game is known for beeing one of the first games supporting gaming thru connected cables. We knew that this worked between Amigas, but to my newest investigation and knowledge this also works between Amiga and Atari versions of the game also. Just follow the network instructions once you have connected the Serial or Null Modem cable between machines. Remember to connect them before you turn on each of the machines as these cables are fragile. Connecting the Amiga & Atari ST computers together couldn’t be simpler. Just connect the serial cable in both computers. When you start Stunt Car Racer, select the link up option on one of the computers, then select the link option on the other and it will connect almost instantly. Names and track selection are entered on the computer which kicked off the link up option first, then you just need a mate to come round so you can get into racing! 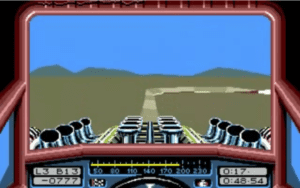 Stunt Car Racer on Amiga 1200. Yes you can also connect Amiga 1200 68030 powered machine with Atari Falcon030 and play this game. One of the most known Lotus racing games from Gremlin. 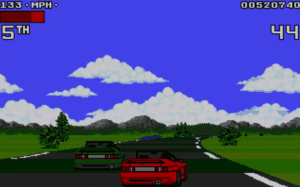 This racing game also supports gaming thru Serial connection. The Amiga and Atari ST version is able to use the serial port and connect to another Amiga or Atari ST running Lotus 2, thus making possible of three or four players to play at the same time. This game is way more arcade like than Stunt Car Racer which is a arcade racer also, but that game is way more “simulator” alike game. Both of these racing games are fantastic. Even though Amiga version have better music, the graphics and gameplay is very similar. Atari 520ST also manages to have a few more FPS than Amiga 500 because of a faster CPU. So here its tight about who is better or worse. If you have both Atari 520ST, Amiga 500, Atari Falcon030 and Amiga 1200 etc. Or any other Amiga actually. Playing these two games over Serial connection shouldn’t be a problem. But don’t worry! This isn’t our last article about this. We just need to digg deeper into this possibility. Connecting these two rivals from Commodore and Atari is special, but a very cool feeling. This is exactly what Microsoft tries to arrange with Sony to get XBOXONE and PS4 games to be compatible.